This is the story of VW's timeless classic, the Type 2 Transporter, universally known as the "Bus". It is sixty years since the idea of VW's Transporter was conceived by Dutchman Ben Pon after seeing motorized trollies conveying components around the British-managed Wolfsburg factory in the mid-1940s. With blueprints complete by November 1948, the "Bulli" as it was known in Germany went into production a year later. The 100,000th Transporter was built in October 1954, the millionth in 1961 and the 3 millionth in 1971, the total number of vehicles exceeding 6.5 million. The Transporter changed little in concept throughout decades of production, and remained in production in Brazil until very recently, nearly six decades after its postwar German debut. 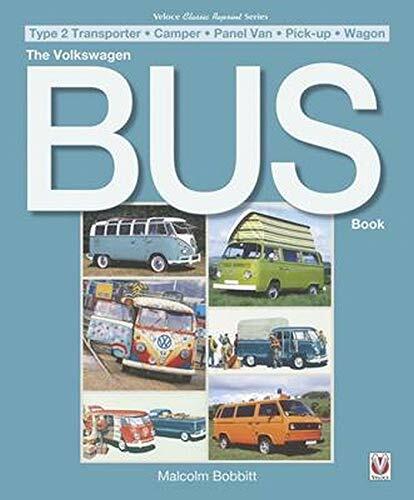 Researched in incredible detail, this book explores the story of the VW bus, from early origins through to the present day. This entirely new edition includes details of many of the different camper conversions, and examines the social history and the T2's evolution. Including full specifications, production figures and buying advice, this totally reworked classic is an interesting, highly informative read and a must for any VW enthusiast. Malcolm Bobbitt has been fascinated by the motor car since buying an Austin 7 before he was old enough to drive! After a career in the electricity industry, Malcolm is now a writer who chooses mainly to write about motoring history. Malcolm lives in England's beautiful Lake District. He is a prolific and diverse author, with numerous automotive books published by Veloce, including Citroen DS, Rolls-Royce Silver Shadow & Bentley T,Karmann Ghia coupe and cabriolet, as well as some Essential Buyer’s Guides and books about British Lorries and Taxis!